The first-ever documentary about The Replacements reminds fans that we are not alone in our firm belief that the Minneapolis misfits should have been as big as The Rolling Stones. Cast: Tom Arnold, Grant Hart, Greg Norton, George Wendt, Robert Christgau, Jim DeRogatis, Greg Kot. Color Me Obsessed is the perfect title for a film that intends to answer questions about all things Replacements. The legendary Minneapolis quartet has done little to build upon its own legacy since disbanding on a Chicago stage in 1991. If one is to believe the liner notes for the 2008 reissues of the band’s seven albums and one EP, main songwriter and lead vocalist Paul Westerberg couldn’t be bothered with participating in the project. But that’s probably no surprise to those who follow the band closely––Westerberg has never seemed particularly at ease with the group’s legacy: He’s happy to talk about the band in interviews but some––including bassist Tommy Stinson––have suggested that the gifted tunesmith has never really gotten over his time as the voice of a generation. Writer and director Gorman Bechard opts instead to round up a seemingly endless group of fans and friends who tell the story of The Replacements in the absence of the four critical players. This results in a film that is both heartwarming––especially because the fans more often championed the band than Westerberg, Stinson, Stinson, and Mars themselves did––and maybe too long. Still, this may be one of the freshest takes on the rock documentary in some time. Color Me Obsessed ultimately succeeds more than it fails, and even when it fails you can’t help but like it. Bechard’s style is as affable as a Minnesota lilt and the film’s voice is as warm as a summer afternoon in Georgia. Here’s what to expect: The standard biography that tells the story of a group of Midwestern misfits who started life as The Impediments and had to try something like three times to successfully play a first show and ended just over a decade later on that aforementioned Chicago stage, the members walking off, passing their instruments to members of the road crew during a nail-in-the-coffin version of “Hootenanny”. There’s a discussion of each of the albums and the standard debate about whether the band was really over once it left behind the independent Twin/Tone and signed with Sire. Others question––as fans have done for years––if Bob Stinson’s firing (c.1986) was a clear sign of the end and/or a clear sign that the group was moving in a more commercial direction, or inevitable given the guitarist’s struggles with substance abuse and mental illness. What’s also revealed in the film is that Westerberg and Bob Stinson were engaged in a power struggle that very often involved physical as well as verbal altercations and that, one way or another, they were not going to last forever in the same closed space. Grant Hart and Greg Norton of Hüsker Dü weigh in with opinions on what made the ‘‘Mats so great and lend an extra credibility to a film that is absent many of the major musical players. In the end it’s a film made by fans for the fans, allowing each of us, despite being separated by time, distance, and circumstance, to engage in this conversation about our favorite band and think/realize that we are not alone in our passion/obsession. After all, if Westerberg’s many songs had a message at all it may have been this: You are not alone. 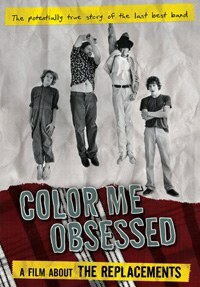 Color Me Obsessed contains no music from The Replacements, no video footage, and none of the images that graced the album covers. If you’re not initiated into the cult of the ‘Mats, you’ll have to seek those things out for yourself but, then again, if you’re not in already, you probably won’t be watching this movie. Still, there are images of old concert fliers, fanzines, and other ephemera from the group’s all-too-short (Or was it? ) career. For all its strengths, the film could have been cut by about 15 minutes and not lost much––there are scenes with one fan that do little to serve the overall arc of the film and almost make him seem a little too obsessed, so much so that it’s almost hard not to read his observations as pure put on. That said, this is a fun-filled and beautifully serious documentary that continues to captivate well beyond the first viewing. The bonus material here reaches epic proportions––including three hours of interview footage, roughly one hour each, with Grant Hart, Robert Christgau, and Jim DeRogatis with Greg Kot. There are 19 deleted scenes, behind-the-scenes interviews with Bechard and producer Hansi Oppenheimer, two commentary tracks, four trailers, and a handsome cover to go with it all.